After Negeri Sembilan we traveled to Melaka, where Malaysia begun. 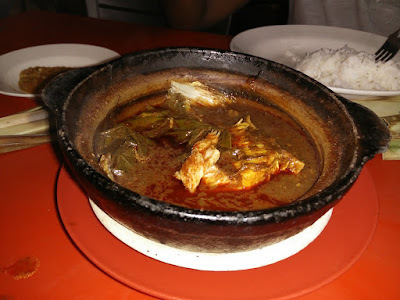 To celebrate our first completed state (for the new mentors) we had Melaka's Claypot Asam Pedas followed by Tandoori and Cheese Naan for supper. It was one of the best Asam Pedas that I have ever tried. It was a wonderful way to end the night. They say a happy worker is a productive worker. I say that the way to make any Malaysian happy is by giving him food. With our stomachs filled, we headed back to the hotel to prepare for the next day. Finances had to be settled, teachers called, and robots inspected and charged. The morning comes and we arrived at the school. We setup our materials and check that every computer has the software installed. The kids were pretty excited to see us, and even more excited to know that we would be teaching them how to play with robots. I believed that it was their first time seeing or even being that closed to robots, and the same gleaming eyes we saw yesterday could be seen on the faces of the students. The students were quite animated, and within the first ten minutes, they started pitting their mbots against each others. There were others who were more focused on exploring the limits of the bots. 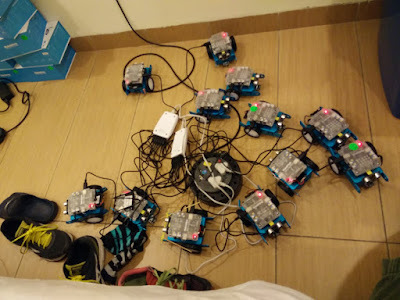 Some of them even managed to make the robot move automatically when it detects an obstacle, just like the automatic vacuum robot! Shout out to the kid who managed to complete the entire module all by himself, his mettle is strong. One of the kids even gave me his address and asked me to come over, which was very endearing. At the end of the workshop, a sizeable number of students asked us how could they get their hands on the robots, and how they could pursue robotics further. To me, this was more validation that what we're doing actually matters. As it is customary with every post, here are the wonderful students of the school! If you don't believe me about their enthusiasm, then let these pictures show you how it was! That's the end of my post for today, I hope that tomorrow's going to be as great as today!